Perfect for tailgate sliders or a superbowl party, this is also an easy to fix, easy pleasin' summer dish! It's great for a backyard party with friends, a quick weekday dinner, or a Sunday family brunch. Mix mayo and 1/8 cup Dijon mustard. 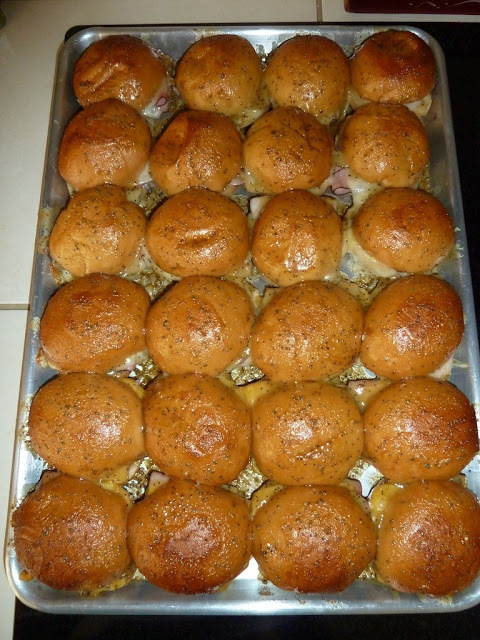 Slice rolls; spread the mustard/may mixture on the bottom halves and fit them into an 11x15 sheet pan. Place one slice of ham and one slice of cheese (each of these folded in half) on the bottom half of each roll, then sprinkle with freshly ground black pepper and replace tops. Whisk together remaining ingredients. Brush tops of the sliders liberally with sauce, then pour remaining sauce over all. Cover pan with foil and refrigerate for 4 to 24 hours. Bake covered in preheated oven, 350 degrees, for 10 minutes. Uncover and bake another 10 to 15 minutes until the tops are golden brown. Garnish with chopped herbs such as basil and parsley if desired. Enjoy with Peach Creek Vineyards Regal Red or A Little Zinful Wines. This recipe is also a great way to use Spiral Sliced Ham leftover from Easter dinner (it can be either shredded or sliced). Adapted from http://syddallfamilyeatingitup.blogspot.com; photo credit to same.